Serenity and meditation contrast with melancholy and savagery; primitive passions yield to poignancy, nobility and tenderness in Bloch’s accomplished chamber music. Five substantial pieces are recorded here, dating from different stages of the composer’s career and demonstrating both the programmatic elements of his writing and his Impressionistic side. 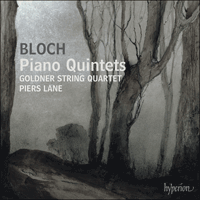 Bloch’s deep affinity for string instruments and the piano is also given ample expression in these works, all of which deserve a permanent place in the chamber music repertoire. They are given performances of great vitality and sensitivity by the Goldner String Quartet and Piers Lane. Ernest Bloch composed chamber music throughout his life. In addition to duos for voice, violin, viola, cello, flute and trumpet, all with piano accompaniment, he wrote one piano trio, five substantial string quartets, several smaller pieces for string quartet, and two piano quintets. Bloch had learned the violin from an early age, and showed such promise during his student years that he would doubtless have become a professional performer had not Eugène Ysaÿe—his teacher and mentor at the Brussels Conservatoire from 1896 to 1899—sensed a profound talent for composition in his teenage pupil, and encouraged him to pursue this path instead. Though writing music became his primary focus, Bloch continued to nurture his abilities as a violinist, and later became an accomplished pianist as well. His deep affinity for string instruments and the piano is given ample expression in the five works on this recording, three of which date from his years as Director of the Cleveland Institute of Music (which he founded in 1920), and two of which were completed during his American West Coast period. The Piano Quintet No 1 was completed in March 1923 after two years of arduous effort. It had originally been conceived as a three-movement sonata for cello and piano, incorporating some themes that Bloch had created during his childhood; but it was shelved while he was working on the second movement. Having almost destroyed the mass of accumulated sketches in a moment of depression, he came to the realization that a larger framework could successfully accommodate his expanding ideas; and the medium of string quartet plus piano—with the piano as ensemble instrument rather than solo—was selected. The result was a work of epic dimensions lasting over half an hour, and comprising three movements: Agitato, leading without pause into Andante mistico, and finally Allegro energico. The premiere was given by Harold Bauer and the Lenox Quartet during the inaugural concert of the League of Composers in New York on 11 November 1923. Introduced at the very outset of the first movement is one of the distinctive features of this work that has provoked a great deal of discussion among commentators and scholars, namely the composer’s use of quarter-tones. Bloch made a special point of emphasizing that his intention—so far from creating a quarter-tone ‘system’—was rather to inflect, upwards or downwards, the existing diatonic and chromatic intervals of standard Western keys and scales, in order to intensify even further the enormous range of emotions with which the quintet is replete. The opening pages of the work contain the motivic materials upon which the entire quintet is based. Thus, as in most of Bloch’s multi-movement compositions, the overall form is cyclic. Some of the motifs are simple and narrow in range, whereas others, by contrast, are more complex and cover a wider gamut; but all are short and succinct, and all are subjected to extensive development—melodically, harmonically and rhythmically. The first movement is a vigorous essay in a modified sonata form. There are six main ideas, from which further material is generated: (i) a brooding phrase no wider than a minor third that moves tightly around the tonic C at its first appearance on the piano; (ii) a crisply angular figure comprising intervals of the fourth and seventh also pivoting around C and introduced by the strings; (iii) a sweeping lyrical melody that is first heard on the strings in their highest register; (iv) a subdued motif first presented by the viola; (v) a slowly rising chromatic figure played by viola and cello in octaves; and (vi) a dramatic quaver motif first heard in the piano in triple octaves, then harmonized in consecutive root-position triads, and subsequently in bare fifths. It is with this figure that the movement ends. The second movement opens with motif (ii) from the first movement. Here, however, the dissonant interval of the major seventh is expanded into an octave. This consonance, together with the establishment of a gentler tempo, has the effect of transforming its formerly violent character into one of tenderness. This kind of dramatic metamorphosis is typical in Bloch’s cyclic method. There are several other prominent motifs: (vii) a repeated rising fourth first heard in the cello; (viii) a descending figure also played for the first time by the cello; (ix) a plaintive gesture comprising an upward arpeggio ending with repeated quarter-tone inflections appearing on the first violin; (x) two adjacent motifs reminiscent of material in Bloch’s Schelomo (a rhapsody for cello and orchestra of 1916); and finally (xi) an idea, in quasi-Lydian mode, similar to those in other works of Bloch that evoke the folk idiom of his native Switzerland. The finale opens with a powerfully rhythmical metamorphosis of motif (i) from the first movement; and motif (ii) appears later in the movement. New material takes several forms: (xii) a triadic motto theme suggestive of an Alpine horn call, first heard on viola and cello; (xiii) a slower-moving, heavily accented motif designated barbarico in the score; (xiv) a spiky theme in dotted notes in the piano; and (xv) an expansive lyrical motif mainly in the whole-tone scale, apparently derived from a Caribbean chant. Towards the end there is a long passage based on the notes D and A in the bass register which eventually resolve to tonic C; and it is on this major chord that the work peacefully concludes. In the words of the British critic Ernest Newman: ‘There is no more welcome, more impressive, more clinching, more conclusive, more authoritative C major chord in all music.’ This key carried special spiritual connotations for Bloch; and in this context, it serves to resolve the harmonic ambiguities found in the main body of this work. Apart from differences in tempo, the three movements exhibit remarkable similarities in terms of technique and style. In each can be found melodies constructed from small cells, accumulated in upward or downward sequences, then imitated, inverted and ornamented in a multiplicity of ways. Gritty motifs contrast with soaring solos. Some of the string writing is contrapuntal, where two or more primary themes may be combined; other passages are written in unisons and octaves, or with the support of sustained chords and drones. Special features include rapidly repeated notes, double and triple stopping, harmonics, use of mutes, sul ponticello and sul tastiera, col legno, glissando, and pizzicato strumming. The overall sonority is often that of a string orchestra rather than a quartet. The piano part is similarly demanding, many passages requiring virtuoso skills. Arabesques, tremolos, ostinatos and hammered chords all take their place alongside lyrically expressive cantabile writing. A section of the finale contains a motif featuring acciaccaturas in which Bloch encourages the pianist to sound ‘like an exotic bird’. Tonalities and modalities fluctuate and are sometimes left undefined through the use of open fifths and octaves and whole-tone harmony. Simple diatonic triads are often superimposed in unusual combinations. Rhythms are sometimes freely rhapsodic, sometimes trenchant; and syncopations and other cross-rhythms abound. However, the ‘Scotch snap’, so frequent in many Bloch works, is largely absent here. Moods are extreme, and they change dramatically—sometimes with little or no warning. Serenity and meditation contrast with melancholy and savagery; primitive passions yield to poignancy, nobility and tenderness. Bloch’s independence of spirit is vividly expressed in the statement he made about his quintet: ‘I write without any regard to please either the so-called “ultra-moderns” or the so-called “old-fashioned”.’ And though he neither applied a ‘programme’ to this quintet nor categorized it among his ‘Jewish’ works, there are distinct resonances with earlier compositions such as the Israel Symphony, Schelomo, and the String Quartet No 1. Bloch wrote several Impressionistic miniatures for string quartet during the 1920s. Night and Paysages (Landscapes) were written in Cleveland between 8 and 13 December 1923; and the premiere of these works was given by the Flonzaley Quartet in Florida in February 1924. Night is similar in mood and style to his other ‘nocturnal’ works, for example the slow movement of the Viola Suite (1919), In the Night (a ‘Love Poem’ for piano, 1922, also in an orchestral version), Nuit exotique for violin and piano (1924) and Three Nocturnes for piano trio (1924). It is a tenebral evocation of Bloch’s love of nature, with limpid melodies, oscillating accompanimental figurations, and gently pulsating rhythms. This work, too, ends with a magical chord of C major. The dedicatee is the American composer Roger Sessions (1896–1985), one of Bloch’s most illustrious pupils. Depiction of the natural world is again the focus in Paysages (Landscapes), but here the geographical locations of each of the three contrasting movements are clearly delineated: the frozen wastes of the Arctic, the lush vegetation of the Alpine landscape, and the pulsating energy of life as lived in the islands of the South Pacific. Ever since his youth, Bloch had been fascinated by the ‘exotic’. For example, as a child he had read legends about the Incas that made an indelible impression upon him, according to his own testimony. When, in his early twenties, he came to know the celebrated music critic Robert Godet, he was spellbound by the older man’s personal descriptions of Java, Sumatra and Borneo. When preparing lectures for the Geneva Conservatoire between 1911 and 1916, he researched collections of traditional music from Africa and the Arctic regions. Bloch never had the opportunity to visit such places, and this caused him much frustration and regret. However, following his arrival in New York in 1916, he was able to travel extensively throughout the New World, and gradually developed a strong affinity for Native American cultures from every part of the continent. All of these—as well as the more familiar Jewish influences—inspired Bloch; and as a result he incorporated into his compositions motifs, melodies, rhythms and textures typical of these widely separated ethnicities. North (Moderato molto), the first movement of Paysages, was inspired by Robert Flaherty’s film about Eskimo life, Nanook of the North. Bloch was overwhelmed by the vivid images portrayed—to the extent that he was unable to sleep after the showing. In one hour, in the middle of the night, he completed North. This has been described by one commentator as ‘a study in pianissimo’, descriptive of the bleakness and desolation of icy wastes. Against a backdrop of frequently repeating quavers in groups of four and three respectively, marked ‘without expression’ at the beginning (the time-signature of this movement is mainly 7/8), motifs comprising oscillating semitones or augmented seconds are occasionally interrupted by phrases covering much wider intervals. Switzerland, the country of Bloch’s birth, was a further source of inspiration to the composer; and again, motifs from the Swiss folk repertoire find their way into many of his works, including the middle movement of Paysages: Alpestre (Allegretto). This pastoral essay is altogether warmer and more lyrical. There are four main ideas: the opening melody on viola that swoops low then high, rather as a bird in flight; a tighter motif of narrow compass that suggests the Lydian mode, also introduced by viola; an ornamented phrase on the first violin; and a passage marked misterioso played by all four instruments. The finale is entitled Tongataboo (Allegro) and evokes the pounding dance and percussion traditions of the island of Tongatapu in the Tongan archipelago. There are striking rhythmical similarities here with the finale of the Piano Quintet No 1. Apart from several secondary motifs, there is one prominent theme that first appears on the first violin soon after the beginning, and is then repeated throughout the movement. This work was dedicated ‘to my dear friend Carl Engel’, the American musicologist (1883–1944). The first of the Two Pieces for string quartet (Andante moderato) was completed in Châtel, Haute-Savoie, on 7 November 1938—some two months prior to Bloch’s return to the USA after eight years in Europe. The second (Allegro molto) was finished nearly twelve years later in Agate Beach, Oregon, on 4 October 1950. They are dedicated to the Griller String Quartet, ardent champions of Bloch’s chamber music both in their native United Kingdom and abroad. These short movements, based on motifs appearing in sketches that date from much earlier in Bloch’s life, have been described as ‘studies’ for the larger String Quartets Nos 2–5 that he composed respectively in 1945, 1952, 1953 and 1956. The first piece is typical of Bloch’s lyrical style. Elements of counterpoint alternate with chordal passages; and the chromaticisms are always conceived within the context of tonality or modality. A relatively calm mood at the beginning and at the end contrasts with the violent intensity of the middle portion of the movement, the main theme of which recurs in the middle of the second piece, a vigorous perpetuum mobile in 6/8 time. Here, aside from a brief respite about half way through, the momentum is maintained by the use of rapidly repeated notes and chords, accents, and rhythms of ‘two against three’. Whereas the first piece ends quietly in low register in Bloch’s meditative key of C major, the second concludes fortissimo in high tessitura with a passage in the Lydian and Phrygian modes on B. Unlike Night and Paysages, the Two Pieces appear to have no directly programmatic intent. The Piano Quintet No 2, composed between February and July 1957, was the last piece of chamber music that Bloch wrote. He was already suffering from the colonic cancer to which he finally succumbed two years later, and had been unsure as to whether he would live long enough to complete the commission received from the Music Department of the University of California at Berkeley to contribute a work for the inauguration of the Alfred Hertz Memorial Hall of Music during the May T Morrison Festival in 1958. Bloch was characteristically determined to honour this invitation, especially as he had had a close relationship with Berkeley; and indeed, of the six composers invited to join in this project (the others being Arthur Bliss, Darius Milhaud, Roger Sessions, William O Smith, and Randall Thompson), his was the first work to be submitted. The premiere was given by Marjorie Petray and the Griller Quartet in the Hertz Hall on 15 April 1958. The opening movement, Animato, begins energetically with a four-bar introduction leading to the first of several themes, two of which are dodecaphonic tone rows. However, as with his quarter-tones, Bloch had no intention of creating or following a ‘system’. In fact, he eschewed ‘serial’ composition, preferring, rather, to use all twelve semitones of the chromatic scale within a tonal/modal context. In this work he emphasized his individual approach by inserting into the first row two extra notes, a perfect fifth apart. Elsewhere, there are tritones in abundance, wide leaps alternating with scalic contours, motifs and harmonic progressions assembled in an ever-rising sequence, passages of gritty homophony juxtaposed with flowing polyphony, dissonances resolving into consonances, and an exploration of the entire dynamic range—tending, however, more to forte than to piano. The slow movement, Andante, offers a further example of Bloch’s love of the mystical, the lyrical, and the pastoral. It is an air with variations, beginning in C sharp minor, replete with oscillating triplet figurations in the piano part, and mellifluous counterpoint in the strings. Shortly before the climax near the end of the movement there are two passages that are reminiscent of prominent motifs from Schelomo and the Suite hébraïque. Following without a break is the finale, Allegro, characterized by its motoric drive. Much of the writing is similar to that of the first movement. However, after a series of cascading scales, the mood changes and the tempo broadens into the concluding Calmo section which brings the work to a close—pianissimo—in the key of E major. The second quintet resembles the first, insofar as each comprises three movements contrasting in tempo, and each explores a vast palette of emotions, textures and sonorities—although, admittedly, there are no instructions in the second quintet to evoke exotic birds. However, over the period of three-and-a-half decades that separates the quintets, Bloch’s compositional style changed dramatically, and this is reflected in the differences of dimension and ethos of each work. The first is panoramic in its proportions, whereas the second is concentrated and concise. Furthermore, there is more of Bloch the ‘neo-romantic’ in the first, and more of Bloch the ‘neo-classicist’ in the second. However, the consensus of opinion among commentators that the second quintet is more ‘detached’, ‘sober’, ‘abstract’ and ‘objective’ than the first must be seriously challenged. Bloch’s last years were spent in relative seclusion on the Oregon coast, his poor health allowing him to travel only rarely. Yet the vitality of most of the works he composed in his mid- to late-seventies reveals a strength of spirit and creativity that might rival that of a man half his age. The two piano quintets make mutually enriching companions and, together with the quartet pieces, deserve a permanent place in the chamber music repertoire. Toute sa vie durant, Ernest Bloch composa de la musique de chambre: des duos pour voix, violon, alto, violoncelle, flûte et trompette, tous avec accompagnement pianistique, mais aussi un trio avec piano, cinq quatuors à cordes substantiels, plusieurs autres de moindre envergure et deux quintettes avec piano. Bloch apprit le violon très tôt et il se montra si prometteur qu’il serait sûrement devenu professionnel si Eugène Ysaÿe—son professeur et mentor au Conservatoire de Bruxelles, de 1896 à 1899—n’avait senti en cet adolescent un profond talent de compositeur. Dès lors encouragé à suivre plutôt cette voie, Bloch se concentra sur l’écriture, tout en continuant d’entretenir son aptitude au violon; plus tard, il devint aussi un pianiste accompli. Sa profonde affinité avec les instruments à cordes et avec le piano transparaît largement dans les cinq œuvres enregistrées ici—trois composées quand il dirigeait le Cleveland Institute of Music (qu’il fonda en 1920) et deux achevées lors de son séjour sur la côte ouest des États-Unis. Le Quintette avec piano no 1 fut terminé en mars 1923, après deux années d’efforts pénibles. Bloch envisagea d’abord une sonate en trois mouvements pour violoncelle et piano, avec des thèmes créés dans son enfance, mais il y renonça au deuxième mouvement. Puis, dans un moment de dépression, il détruisit presque toutes les esquisses accumulées avant de finalement comprendre qu’un cadre plus large pourrait accueillir avec succès ses idées grandissantes; il opta pour un quatuor à cordes augmenté d’un piano, ce dernier étant plus un instrument d’ensemble que solo. Le résultat fut une œuvre aux dimensions épiques (plus d’une demi-heure), en trois mouvements: Agitato, relayé par Andante mistico et, enfin, Allegro energico. La première fut donnée par Harold Bauer et le Lenox Quartet lors du concert inaugural de la League of Composers (New York, 11 novembre 1923). D’emblée, le premier mouvement affiche l’une des caractéristiques marquantes de ce quintette, qui fit tant débat chez les commentateurs et les spécialistes: l’usage de quarts de ton. Bloch insista beaucoup sur sa volonté non pas de créer un «système» microtonal, mais bien d’infléchir, vers le haut ou vers le bas, les intervalles existants (diatoniques et chromatiques) des tons et des gammes occidentaux standard pour élargir l’immense palette d’émotions dont ce quintette regorge déjà. Les pages d’ouverture renferment les matériaux motiviques sur lesquels tout le quintette repose. La forme globale est donc cyclique, comme dans la plupart des compositions en plusieurs mouvements de Bloch. Certains motifs sont simples et couvrent une gamme étroite, tandis que d’autres sont plus complexes et embrassent une palette plus large; mais tous sont courts, concis, soumis à un extensif développement mélodico-harmonico-rythmique. Le premier mouvement est un vigoureux essai dans une forme sonate modifiée, avec six idées principales, d’où découle un autre matériau: (i) une phrase menaçante, pas plus large qu’une tierce mineure, évoluant tout contre l’ut de tonique, à sa première apparition au piano; (ii) une acerbe figure anguleuse avec des intervalles de quarte et de septième, pivotant également autour d’ut et introduite par les cordes; (iii) une ample mélodie lyrique exposée aux cordes, dans leur registre le plus aigu; (iv) un motif sobre, énoncé pour la première fois par l’alto; (v) une figure chromatique lentement ascendante jouée par l’alto et par le violoncelle en octaves; et (vi), un dramatique motif en croches énoncé au piano en triples octaves avant d’être harmonisé d’abord en triades à l’état fondamental successives puis en quintes dépouillées. C’est sur cette figure que le mouvement s’achève. Le deuxième mouvement s’ouvre sur un motif (ii) du premier mouvement. Ici, cependant, l’intervalle dissonant de septième majeure est étendu à une octave. Cette consonance, alliée à l’instauration d’un tempo plus doux, a pour effet de muer la violence en tendresse—une métamorphose spectaculaire typique de la méthode cyclique de Bloch. Plusieurs motifs saillants sont discernables: (vii) une quarte ascendante répétée, d’abord entendue au violoncelle; (viii) une figure descendante inaugurée par le même instrument; (ix) un geste plaintif avec un arpège ascendant s’achevant sur des inflexions microtonales répétées au premier violon; (x) deux motifs adjacents rappelant le matériau de Schelomo (rhapsodie pour violoncelle et orchestre de Bloch, 1916); et enfin (xi), une idée, en mode quasi lydien, semblable à celle d’autres œuvres dans lesquelles Bloch évoque l’idiome folklorique de sa Suisse natale. Le finale commence par une métamorphose puissamment rythmique du motif (i) du premier mouvement; le motif (ii) apparaît plus tard dans le mouvement. Un nouveau matériau prend plusieurs formes: (xii) un thème conducteur triadique suggérant un appel de cor des Alpes, entendu d’abord à l’alto et au violoncelle; (xiii) un motif lourdement accentué, évoluant plus lentement, dit barbarico dans la partition; (xiv) un thème piqueté de notes pointées au piano; et (xv) un expansif motif lyrique essentiellement dans la gamme anhémitonique, dérivé, semble-t-il, d’un chant caribéen. Vers la fin, un long passage fondé sur les notes ré et la, dans le registre grave, se résout sur l’ut de tonique; et c’est sur cet accord majeur que l’œuvre s’achève paisiblement. Pour citer le critique britannique Ernest Newman: «Il n’y a pas, dans toute la musique, un accord d’ut majeur plus bienvenu, plus impressionnant, plus décisif, plus conclusif, plus autoritaire.» Pour Bloch, cette tonalité avait des connotations spirituelles particulières; ici, elle lui permit de lever les ambiguïtés harmoniques du corps principal de l’œuvre. Tempo excepté, les trois mouvements arborent de remarquables similitudes techniques et stylistiques, chacun donnant à entendre des mélodies construites à partir de petites cellules, accumulées en séquences ascendantes ou descendantes, puis imitées, renversées, ornées de multiples façons. Des motifs incisifs contrastent avec des solos filants. L’écriture des cordes est en partie contrapuntique, quand deux thèmes principaux ou plus peuvent être combinés; les autres passages sont écrits en unissons, en octaves ou encore avec le soutien d’accords tenus et de bourdons. L’œuvre se démarque surtout par ses notes répétées rapidement, ses doubles et triples cordes, ses harmoniques, son usage de sourdines, son jeu sul ponticello et sulla tastiera, col legno, son glissando et son tapotage en pizzicato. La sonorité globale est plus souvent celle d’un orchestre à cordes que d’un quatuor. La partie de piano s’avère tout aussi exigeante, maints passages requérant des talents de virtuose. Arabesques, trémolos, ostinatos et accords martelés ont tous leur place aux côtés d’une écriture cantabile lyriquement expressive. Une section du finale renferme un motif doté d’acciaccature dans lesquelles Bloch encourage le pianiste à sonner «comme un oiseau exotique». Les tonalités et les modalités fluctuent, restant parfois indéterminées par l’usage de quintes et d’octaves à vide, mais aussi par une harmonie anhémitonique. De simples triades diatoniques sont souvent surimposées dans des combinaisons inhabituelles. Les rythmes sont tantôt librement rhapsodiques, tantôt tranchants, avec force syncopes et autres contre-rythmes. À noter, cependant, l’absence quasi totale du rythme lombard si cher à Bloch. Les climats, extrêmes, changent drastiquement—avec ou sans léger avertissement. La sérénité et la méditation contrastent avec la mélancolie, la sauvagerie; les passions primitives succombent au caractère poignant, à la noblesse et à la tendresse. L’indépendance d’esprit du compositeur s’exprime vivement dans ces propos sur son quintette: «J’écris sans me soucier de plaire aux soi-disant ‘ultramodernes’ ou aux soi-disant ‘vieux jeu’.» Et bien que ce quintette ne soit en rien «programmatique», bien qu’il ne soit pas rangé dans les œuvres «juives» de Bloch, il affiche de nettes résonances avec des compositions antérieures comme la Symphonie Israel, Schelomo et le Quatuor à cordes no 1. Les années 1920 virent naître plusieurs miniatures impressionnistes pour quatuor à cordes de Bloch. Night et Paysages (Landscapes) furent composées à Cleveland du 8 au 13 décembre 1923 et créées par le Flonzaley Quartet en Floride, en février 1924. Par son climat comme par son style, Night s’apparente aux autres pièces «nocturnes» de Bloch, tels le mouvement lent de la Suite pour alto (1919), In the Night (un «poème d’amour» pour piano de 1922, qui existe aussi en version orchestrale), Nuit exotique pour violon et piano (1924) et Three Nocturnes pour trio avec piano (1924). Cette évocation ténébreuse de l’amour de Bloch pour la nature, faite de mélodies limpides, de figures d’accompagnement oscillantes et de rythmes doucement battants s’achève, elle aussi, sur un magique accord d’ut majeur. Elle est dédiée au compositeur américain Roger Sessions (1896–1985), l’un des plus illustres élèves de Bloch. La description de la nature est également au cœur de Paysages (Landscapes); mais, ici, chacun des trois mouvements contrastés est géographiquement bien localisé: les étendues gelées de l’Arctique, la luxuriante végétation alpestre et la vibrante énergie de l’existence telle qu’on la mène dans les îles du Pacifique Sud. Depuis tout jeune, Bloch avait été fasciné par l’«exotique». Enfant, il avait notamment lu des légendes sur les Incas qui, de son propre aveu, lui avaient laissé une impression indélébile. À vingt ans un peu passés, il rencontra le célèbre critique musical Robert Godet, dont les descriptions de Java, de Sumatra et de Bornéo l’envoûtèrent. Dans le cadre de conférences pour le Conservatoire de Genève, entre 1911 et 1916, Bloch se mit en quête de recueils de musiques traditionnelles venues d’Afrique et de l’Arctique—des régions qu’il ne put jamais visiter, ce qui lui valut bien des frustrations et des regrets. Il put, toutefois, parcourir tout le Nouveau Monde à partir de 1916 (année de son arrivée à New York) et développa peu à peu une forte affinité avec les cultures autochtones des quatre coins du continent américain. Toutes l’inspirèrent—au même titre que les influences juives, plus familières—et ses compositions contiennent des motifs, des mélodies, des rythmes et des textures typiques de ces ethnicités bien marquées. North (Moderato molto), le premier mouvement de Paysages, fut inspiré par Nanook of the North, le film de Robert Flaherty sur la vie esquimaude. Après la projection, Bloch avait été bouleversé par les très vivants tableaux qu’il avait vus, au point de n’avoir pu trouver le sommeil. Il acheva North en une heure, au beau milieu de la nuit. Un commentateur l’a décrit comme une «étude de pianissimo», une peinture du caractère morne et désolé des solitudes glacées. Sur un fond de croches fréquemment répétées, respectivement par groupes de quatre et de trois, d’abord marqués «sans expression» (le signe de la mesure de ce mouvement est 7/8), des motifs comprenant des demi-tons oscillants ou des secondes augmentées sont parfois interrompus par des phrases couvrant des intervalles bien plus larges. Bloch fut également inspiré par sa Suisse natale: des motifs empruntés au répertoire populaire suisse émaillent nombre de ses œuvres, notamment le mouvement central de Paysages: Alpestre (Allegretto). Cet essai pastoral, autrement plus chaleureux et lyrique que North, renferme quatre idées principales: la mélodie d’ouverture à l’alto, qui descend en piqué puis remonte, un peu comme un oiseau en vol; un motif resserré, d’ambitus étroit, qui suggère le mode lydien et est également introduit par l’alto; une phrase ornée, au premier violon; et un passage marqué misterioso joué par les quatre instruments. Le finale, intitulé Tongataboo (Allegro), évoque la danse trépignante et les percussions traditionnelles de l’île de Tongatapu, dans l’archipel des Tonga. On décèle ici de saisissantes similitudes rythmiques avec le finale du Quintette avec piano no 1. Outre plusieurs motifs secondaires, un thème saillant apparaît d’abord au premier violon, peu après le début, avant d’être repris tout au long du mouvement. Cette œuvre est dédiée «à mon cher ami Carl Engel», musicien américain (1883–1944). La première des Two Pieces pour quatuor à cordes (Andante moderato) fut achevée à Châtel, en Haute-Savoie, le 7 novembre 1938—quelque deux mois avant le retour de Bloch aux États-Unis, après huit ans passés en Europe. La seconde (Allegro molto) fut terminée presque douze ans plus tard à Agate Beach (Oregon), le 4 octobre 1950. Toutes deux sont dédiées au Griller String Quartet, dont les membres défendirent ardemment la musique de chambre de Bloch, dans leur Royaume-Uni natal comme à l’étranger. Ces courts mouvements, fondés sur des motifs empruntés à des esquisses bien antérieures, ont été qualifiés d’«études» pour les grands quatuors à cordes nos 2–5 (composés respectivement en 1945, 1952, 1953 et 1956). La première pièce est typique du style lyrique de Bloch. Des éléments contrapuntiques alternent avec des passages en accords et les chromatismes sont toujours conçus dans un contexte tonal ou modal. Le calme relatif du début et de la fin contraste avec la violente intensité de la portion centrale du mouvement, dont le thème principal revient au milieu de la seconde pièce, un vigoureux perpetuum mobile à 6/8. Hormis un bref répit à mi-mouvement environ, l’élan est maintenu par l’usage de notes rapidement répétées, mais aussi d’accords, d’accents et de rythmes à «deux-contre-trois». Alors que la première pièce s’achève paisiblement, dans le registre grave et dans l’ut majeur méditatif de Bloch, la seconde se termine fortissimo en tessiture aiguë, avec un passage dans les modes lydien et phrygien sur si. Contrairement à Night et à Paysages, les Two Pieces semblent n’avoir aucun dessein directement programmatique. Composé de février à juillet 1957, le Quintette avec piano no 2 fut l’ultime musique de chambre de Bloch. Déjà atteint du cancer du colon qui devait l’emporter deux ans plus tard, ce dernier n’était pas sûr de vivre assez longtemps pour pouvoir terminer l’œuvre commandée par le département de musique de l’Université de Californie (Berkeley) pour l’inauguration de l’Alfred Hertz Memorial Hall of Music, prévue lors du May T. Morrison Festival (1958). Il était, ce qui lui ressemblait bien, déterminé à honorer cette invitation, surtout à cause des liens privilégiés qu’il entretenait avec Berkeley; et de fait, des six compositeurs conviés à ce projet, le quintette de Bloch fut terminé le premier (les cinq autres étaient Arthur Bliss, Darius Milhaud, Roger Sessions, William O. Smith et Randall Thompson). Le Quintette fut créé au Hertz Hall le 15 avril 1958 par Marjorie Petray et le Griller Quartet. Le mouvement d’ouverture, Animato, démarre énergiquement par une introduction de quatre mesures débouchant sur un thème—plusieurs autres suivront, dont deux séries dodécaphoniques. Cependant, comme avec les quarts de ton, Bloch ne voulut en rien créer ou suivre un «système». En réalité, il éluda la composition «sérielle» et préféra utiliser les douze demi-tons de la gamme chromatique dans un contexte tonal/modal. Dans cette œuvre, il souligna son approche singulière en insérant dans la première série deux notes supplémentaires, à une quinte parfaite d’écart. Ailleurs, les tritons abondent, de larges sauts alternent avec des contours en gammes, des motifs et des progressions harmoniques sont assemblés en une séquence toujours ascendante, des passages à l’homophonie incisive sont juxtaposés à une polyphonie fluide, des dissonances se résolvent en consonances, et toute la gamme dynamique est explorée—tendant cependant plus à forte qu’à piano. Le mouvement lent, Andante, illustre, lui aussi, l’amour de Bloch pour le mystique, le lyrique et le pastoral. Il s’agit d’un air avec variations qui, s’ouvrant en ut dièse mineur, est gorgé de figurations en triolets oscillantes (piano) et de mélodieux contrepoints (cordes). Peu avant l’apogée, vers la fin du mouvement, deux passages rappellent les motifs saillants de Schelomo et de la Suite hébraïque. Embrayant directement, le finale, Allegro, se caractérise par son élan «motorique». Son écriture est en grande partie similaire à celle du premier mouvement. Pourtant, passé une série de gammes cascadantes, le climat change et le tempo s’évase en une section conclusive Calmo, qui clôt l’œuvre—pianissimo—en mi majeur. Le second quintette ressemble au premier: tous deux comprennent trois mouvements aux tempos contrastés et explorent un large éventail d’émotions, de textures et de sonorités—même si, reconnaissons-le, jamais le second quintette n’enjoint d’évoquer les oiseaux exotiques. Néanmoins, en trente-cinq ans, le style compositionnel de Bloch subit un changement spectaculaire, perceptible dans les différences de dimension et d’ethos. Le premier quintette arbore ainsi des dimensions panoramiques, quand le second est concentré, concis. Par ailleurs, le premier laisse transparaître davantage le Bloch «néoromantique», là où le second reflète plus le Bloch «néoclassique». Reste qu’il faut sérieusement revoir le consensus en vertu duquel les commentateurs tiennent le second quintette pour plus «détaché», «sobre», «abstrait» et «objectif» que le premier. Bloch passa ses dernières années dans une relative réclusion, sur la côte de l’Oregon, sa mauvaise santé ne l’autorisant guère à voyager. Pourtant, la vitalité de presque toutes les œuvres qu’il composa à partir de soixante-quinze ans révèle une force d’esprit et une créativité que bien des quadragénaires pourraient lui envier. Ses deux quintettes avec piano s’enrichissent mutuellement et forment, aux côtés des quatuors, un diptyque qui mérite de figurer définitivement au répertoire de la musique de chambre. Ernest Bloch komponierte sein Leben lang Kammermusik. Abgesehen von seinen Duos für Gesang, Violine, Bratsche, Cello, Flöte und Trompete, jeweils mit Klavierbegleitung, schrieb er ein Klaviertrio, fünf beachtliche Streichquartette, mehrere kleinere Stücke für Streichquartett und zwei Klavierquintette. Bloch hatte von früher Kindheit an Violine gelernt und war in seinen Studienjahren so vielversprechend, dass er zweifellos ein professioneller Geiger geworden wäre, wenn Eugène Ysaÿe—von 1896–99 sein Lehrer und Mentor am Brüsseler Konservatorium—in seinem jugendlichem Schüler nicht ein großes Talent zur Komposition gespürt und ihn angespornt hätte, stattdessen diesen Weg einzuschlagen. Obwohl sich Blochs Hauptaufmerksamkeit auf das Komponieren verlagerte, nährte er weiterhin seine geigerische Begabung und wurde später auch ein fähiger Pianist. Seine große Affinität mit Streichinstrumenten und Klavier drückt sich vielfach in den fünf Werken auf dieser Einspielung aus; drei von ihnen stammen aus seiner Zeit als Direktor des Cleveland Institute of Music (das er 1920 gründete) und zwei entstanden während seiner amerikanischen Westküsten-Periode. Das Klavierquintett Nr. 1 wurde im März 1923 nach zwei Jahren harter Anstrengung vollendet. Es wurde ursprünglich als dreisätzige Sonate für Cello und Klavier konzipiert und enthielt einige Themen, die Bloch bereits in seiner Kindheit erfunden hatte; das Projekt wurde jedoch auf Eis gelegt, als er am zweiten Satz arbeitete. In einem Augenblick von Depression nahe daran war, alle angesammelten Skizzen zu vernichten, erkannte aber, dass er seine erweiterten Ideen erfolgreich in einem größeren Rahmen unterbringen könnte, und entschied sich für das Medium von Streichquartett und Klavier—mit dem Klavier als Ensemble- statt Soloinstrument. Das Resultat war ein Werk von epischem Ausmaß, das über eine halbe Stunde dauert und drei Sätze hat: Agitato, das ohne Unterbrechung in das Andante mistico übergeht, und zuletzt das Allegro energico. Die Uraufführung wurde am 11. November 1923 von Harold Bauer und dem Lenox-Quartett im Eröffnungskonzert der League of Composers in New York gespielt. Gleich am Anfang des ersten Satzes findet sich eines der entscheidenden Merkmale dieses Werkes, das unter Kommentatoren und Forschern zu viel Diskussion führte: die Verwendung von Vierteltönen. Bloch hob besonders hervor, dass es seine Absicht war—weit entfernt von der Erfindung eines Viertelton-„Systems“—die exisitierenden diatonischen und chromatischen Intervalle der üblichen westlichen Tonarten und Skalen auf- und abwärts zu beugen, um die enorme emotionale Bandbreite dieses Quartetts noch weiter auszudehnen. Die Anfangsseiten des Werkes enthalten das motivische Material auf dem das gesamte Quartett beruht. Die Gesamtform wie in den meisten mehrsätzigen Kompositionen Blochs ist also zyklisch. Einige der Motive sind schlicht und schlank, im Gegensatz zu anderen, die komplexer sind und ein breiteres Spektrum umfassen. Alle sind kurz und bündig und werden- melodisch, harmonisch und rhythmisch—gründlich verarbeitet. Der erste Satz ist ein energischer Essay in modifizierter Sonatenform. Aus sechs Hauptideen wird weiteres Material geschaffen: (i) eine grüblerische Phrase, die nicht mehr als eine kleine Terz umfasst und sich bei seinem ersten Erscheinen eng um das Mittel-C des Klaviers bewegt; (ii) eine straff-kantige Figur, die sich aus ebenfalls um C orientierten Quart- und Septim-Intervallen zusammensetzt und von den Streichern eingeführt wird; (iii) eine schweifende lyrische Melodie, die zuerst im höchsten Register der Streicher zu hören ist; (iv) ein verhaltenes Motiv, das zuerst von der Bratsche vorgestellt wird; (v) eine langsam ansteigende chromatische Figur, die von Bratsche und Cello in Oktaven gespielt wird; und (vi) ein dramatisches Achtelmotiv, das zunächst in Tripeloktaven im Klavier erscheint, dann harmonisiert in aufeinander folgenden Dreiklängen in Grundstellung und schließlich in leeren Quinten. Der Satz schließt mit dieser Figur. Der zweite Satz beginnt mit Motiv (ii) aus dem ersten Satz. Hier jedoch wird das dissonante Intervall der großen Septime zur Oktave ausgeweitet. Zusammen mit dem sachteren Tempo bewirkt diese Konsonanz, seinen früheren heftigen Charakter in ein zarteren zu verwandeln. Diese Art dramatischer Metamorphose ist typisch für Blochs zyklische Methode. Es gibt mehrere weitere markante Motive: (vii) eine wiederholte, aufsteigende Quarte, die zuerst im Cello zu hören ist; (viii) eine absteigende Idee, ebenfalls zuerst im Cello; (ix) eine Klagegeste aus einem aufsteigenden Arpeggio, das in wiederholten Vierteltonwendungen auf der ersten Violine endet; (x) zwei benachbarte Motive, die an Material in Bloch Schelomo (Rhapsodie für Cello und Orchester von 1916) erinnern und zuletzt (xi) eine Idee in quasi lydischem Modus, die denen in anderen Werken Blochs ähnlich ist, die an das Volksidiom seiner Schweizer Heimat erinnern. Das Finale beginnt mit einer kraftvoll-rhythmischen Verwandlung von Motiv (i) aus dem ersten Satz, und später im Satz erscheint Motiv (ii) selbst. Neues Material erscheint als (xii) ein Dreiklang-Mottothema, das an ein Alphornsignal erinnert und zuerst auf Bratsche und Cello zu hören ist; (xiii) ein langsameres, stark akzentuiertes Motiv, das in der Partitur mit barbarico überschrieben ist; (xiv) ein widerborstiges Thema in punktierten Noten im Klavier und (xv) ein expansiv-lyrisches, vorwiegend ganztöniges Motiv, das anscheined aus einem karibischen Gesang abgeleitet wurde. Gegen Ende folgt eine lange Passage, die auf den Tönen D und A im Bassregister beruht; sie löst sich schließlich in die Tonika C auf, und das Werk schließt friedlich auf diesem Durakkord. In den Worten des britischen Rezensenten Ernest Newman: „In aller Musik gibt es keinen willkommeneren, eindrucksvolleren, entscheidenderen, endgültigeren, autoritäreren C-Dur-Akkord.“ Diese Tonart hatte für Bloch besondere spirituelle Assoziationen, und in diesem Kontext diente sie, die harmonische Zweideutigkeit des Hauptwerks zu lösen. Abgesehen von den Tempounterschieden zeichnen sich die drei Sätze durch ihre bemerkenswerten Ähnlichkeiten in Bezug auf Technik und Stil aus. In jedem Satz finden sich Melodien, die aus kleinen Zellen konstruiert, in auf- oder absteigenden Sequenzen zusammengefasst, dann auf vielfältige Weise imitiert, umgekehrt oder verziert werden. Handfeste Motive stehen im Kontrast mit beflügelnden Solos. Die Schreibweise für die Streicher ist manchmal kontrapunktisch, wenn zwei oder mehr der Grundthemen kombiniert werden können, andere Passagen stehen im Unisono oder Oktaven, und werden von gehaltenen Akkorden oder Bordun unterstützt. Spezielle Merkmale sind schnelle Tonrepetitionen, Doppel- und Tripelgriffe, Flageolett, Dämpfer, sul ponticello und sul tastiera, col legno, glissando und pizzikato-Strumming. Die Klangwelt ähnelt insgesamt eher der eines Streichorchesters als eines Quartetts. Die Klavierstimme ist ähnlich anspruchsvoll und viele Passagen erfordern virtuose Technik. Arabesken, Tremolos, Ostinatos und gehämmerte Akkorde nehmen ihren Platz neben lyrisch-expressivem Kantabile ein. Ein Abschnitt des Finales enthält ein Motiv mit Vorschlägen, in denen Bloch den Pianisten auffordert, „wie ein exotischer Vogel“ zu klingen. Tonalitäten und Modalitäten fluktuieren und bleiben durch die Verwendung leerer Quinten und Oktaven sowie Ganzton-Harmonien manchmal ungewiss. Schlichte diatonische Dreiklänge werden oft in ungewöhnlichen Kombinationen überlagert. Rhythmen sind manchmal frei rhapsodisch, manchmal durch reichliche Synkopen und andere Kreuzrhythmen verschärft. Der „Scotch snap“ (umgekehrte Punktierung), der so oft in Blochs Werken vorkommt, ist hier jedoch weitgehend abwesend. Die Stimmungen sind extrem und ändern sich dramatisch—manchmal mit wenig oder ganz ohne Vorwarnung. Heiterer Frieden und Meditation stehen mit Melancholie und Wildheit im Kontrast; primitive Leidenschaften geben Wehmut, Vornehmheit und Zärtlichkeit nach. Blochs Unabhängigkeit des Geistes drückt sich lebhaft in der Bemerkung aus, die er über dieses Quintett machte: „Ich schreibe ohne Rücksicht darauf, entweder die sogenannten ,Ultramodernen‘ oder die sogenannten ,Altmodischen‘ zufrieden zu stellen.“ Und obwohl er diesem Quartett weder ein „Programm“ gab, noch es zu seinen „jüdischen“ Werken zählte, resoniert es deutlich mit früheren Kompositionen wie der Israel-Symphonie, Schelomo und dem Streichquartett Nr. 1. In den 1920er Jahren schrieb Bloch mehrere impressionistische Miniaturen für Streichquartett. Night („Nacht“) und Paysages (Landscapes) („Landschaftsbilder“) wurden zwischen dem 8. und 13. Dezember 1923 in Cleveland geschrieben, und das Flonzaley-Quartett spielte im Februar 1924 in Florida die Uraufführung dieser Werke. Night ist in Stimmung und Stil seinen anderen „Nacht“-Stücken ähnlich, wie etwa dem langsamen Satz der Bratschensuite (1919), In the Night („In der Nacht“, ein „Liebesgedicht“ für Klavier, 1922, auch in Orchesterfassung) und die Drei Nocturnes für Klaviertrio (1924). Es ist eine dunkle Heraufbeschwörung von Bruchs Naturliebe, mit klaren Melodien, vibrierenden Begleitungsfiguren und sacht pochenden Rhythmen. Auch dieses Werk schließt mit einem magischen C-Dur-Akkord. Es ist dem amerikanischen Komponisten Roger Sessions (1896–1985), einem der renommiertesten Schüler Blochs, gewidmet. Auch in Paysages (Landscapes) steht die Schilderung der Natur im Brennpunkt, aber hier wird die geographische Position jedes der drei Sätze genau angegeben—die Eiswüste der Arktis, die üppige Vegetation der Alpen und die pulsierende Energie des Lebens auf den pazifischen Inseln. Von Jugend an hatte das „Exotische“ Bloch fasziniert. Als Kind hatte er nach eigener Aussage zum Beispiel Legenden über die Inkas gelesen, die einen unauslöschlichen Eindruck hinterließen. Als er in seinen zwanziger Jahren den berühmten Musikkritiker Robert Godet kennenlernte, war er von den persönlichen Beschreibungen des älteren Mannes von Java, Sumatra und Borneo hingerissen. In der Vorbereitung seiner Vorlesungen für das Konservatorium in Genf zwischen 1911 und 1916, recherchierte er traditionelle Musik aus Afrika und der Arktis. Bloch hatte nie die Gelegenheit, solche Plätze zu besuchen, was ihm viel Frustration und Bedauern bereitete. Nach seiner Ankunft in New York 1916 konnte er er jedoch ausgedehnte Reisen in der Neuen Welt unternehmen und entwickelte allmählich eine starke Vorliebe für die Kulturen der amerikanischen Ureinwohner aus allen Teilen des Kontinents. All diese—sowie die vertrauteren jüdischen Einflüsse—inspirierten Bloch, und im Resultat integrierte er viele für diese ganz unterschiedlichen Volkszugehörigkeiten typischen Motive, Melodien, Rhythmen und Strukturen in seine Kompositionen. North (Moderato molto), der erste Satz der Paysages wurde durch Robert Flahertys Film über das Leben der Eskimos, Nanook of the North („Nanuk, der Eskimo“), inspiriert. Bloch war so sehr von den lebhaften Bildern überwältigt, dass er nach der Filmvorstellung nicht schlafen konnte. Mitten in der Nacht, in einer Stunde, vollendete er North. Es wurde von einem Kommentator als „Studie in Pianissimo“ beschrieben, die die Öde und Trostlosigkeit der Eislandschaft schildert. Vor einer Kulisse von „ausdruckslos“ überschriebenen, in Vierer- oder Dreiergruppen wiederholter Achtel am Anfang (die Taktvorschrift für diesen Satz ist vorwiegend 78) werden Motive von oszillierenden Halbtönen oder großen Sekunden gelegentlich von Phrasen mit wesentlich weiteren Intervallen unterbrochen. Die Schweiz, Blochs Heimatland, war eine weitere Inspirationsqelle für den Komponisten, und Motive aus dem Schweizer Volksrepertoire finden ihren Weg in viele seiner Werke, einschließlich dem Mittelsatz von Paysages: Alpestre (Allegretto). Dieses pastorale Stück ist insgesamt wärmer und lyrischer. Es gibt vier Hauptgedanken: die Anfangsmelodie auf der Bratsche, die wie ein Vogel im Flug erst in die Tiefe dann in die Höhe schweift; ein kompakteres Motiv von engem Umfang, das auf die lydische Tonart anspielt, ebenfalls von der Bratsche eingeführt; eine verzierte Phrase auf der Violine und eine misterioso markierte Phrase, die von allen vier Instrumenten gespielt wird. Das Finale trägt den Titel Tongataboo (Allegro) und beschwört die stampfenden Tanz- und Schlagzeugtraditionen der Insel Tongatapu in der tongaischen Inselgruppe herauf. Hier finden sich auffällige rhythmische Ähnlichkeiten mit dem Finale des Klavierquintetts Nr. 1. Abgesehen von mehreren Nebenmotiven gibt es ein prominentes Thema, das kurz nach Beginn zuerst auf der ersten Violine erscheint und dann den ganzen Satz hindurch wiederholt wird. Dieses Werk wurde „meinem lieben Freund Carl Engel“, dem amerikanischen Musikwissenschaftler (1883–1944), gewidmet. Das erste der Two Pieces („Zwei Stücke“) für Streichquartett (Andante moderato) wurde am 7. November 1938 in Châtel, Haute-Savoie vollendet—etwa zwei Monate vor Blochs Rückkehr in die USA nach acht Jahren in Europa. Das zweite (Allegro molto) wurde nahezu zwölf Jahre später, am 4. Oktober 1950 in Agate Beach, Oregon abgeschlossen. Sie sind dem Griller-Streichquartett gewidmet, glühenden Verfechtern von Blochs Kammermusik in ihrer britischen Heimat sowie im Ausland. Diese kurzen Sätze, die auf Motiven basieren, die in wesentlich früher entstanden Skizzen erscheinen, wurden als „Studien“ für die größeren Streichquartette Nr. 2–5 beschrieben, die er jeweils 1945, 1952, 1953 und 1956 komponierte. Das erste Stück ist für Blochs lyrischen Stil typisch. Elemente von Kontrapunkt wechseln mit akkordischen Passagen ab; und Chromatik erscheint jeweils im Kontext von Tonalität oder Modalität. Eine relativ ruhige Stimmung am Anfang und Ende kontrastiert mit der heftigen Intensität des Mittelteils dieses Satzes, dessen Hauptthema in der Mitte des zweiten Stückes, einem lebhaften Perpetuum mobile im 6/8-Takt, wiederkehrt. Abgesehen von einer kurzen Verschnaufspause etwa halbwegs wird der Impuls durch den Einsatz rapide wiederholter Noten und Akkorde, Akzente und „zwei gegen drei“-Rhythmen aufrecht erhalten. Während das erste Stück leise in tiefem Register in Blochs meditativem C-Dur schließt, endet das zweite fortissimo in hoher Lage mit einer Passage in lydischem und phrygischem Modus auf H. Anders als Night und Paysages scheinen die Two Pieces keine direkte programmatische Absicht zu haben. Das Klavierquintett Nr. 2, das zwischen Februar und Juli 1957 komponiert wurde, war das letzte kammermusikalische Stück, das Bloch schrieb. Er litt bereits an dem Darmkrebs, dem er zwei Jahre später schließlich erlag, und war sich nicht sicher, ob er lange genug leben würde, um den Auftrag erfüllen zu können, den er von der Musikabteilung der University of California in Berkeley erhalten hatte, ein Werk für die feierliche Eröffnung der Alfred Hertz Memorial Hall of Music während des May T. Morrison Festivals 1958 zu schrieben. Bloch war charakteristisch entschlossen, diese Einladung anzunehmen, besonders da er ein enges Verhältnis zu Berkeley hatte; von den sechs Komponisten, die zu diesem Projekt eingeladen wurden, reichte er sogar zuerst seinen Beitrag ein (die anderen Komponisten waren Arthur Bliss, Darius Milhaud, Roger Sessions, William O. Smith, and Randall Thompson). Die Premiere wurde am 15. April 1958 von Marjorie Petray und dem Griller-Quartett in der Hertz Hall gespielt. Der Anfangssatz, Animato, beginnt dynamisch mit einer viertaktigen Einleitung, die zum ersten mehrerer Themen führt, von denen zwei Zwölftonreihen sind. Wie mit den Vierteltönen, hatte Bloch jedoch auch hier nicht die Absicht, ein „System“ zu schaffen oder ihm zu folgen. Er vermied sogar „serielle“ Komposition und bevorzugte stattdessen, die zwölf Halbtöne der chromatischen Tonleiter in einem tonal/modalen Kontext zu verwenden. In diesem Werk unterstrich er seinen individuellen Ansatz, indem er in die erste Reihe zwei extra Noten im Abstand einer reinen Quinte einfügte. An anderen Stellen findet sich häufig der Tritonus, wechseln sich weite Sprünge mit skalenhaften Konturen ab, versammeln sich Motive und harmonische Fortschreitungen in stets ansteigenden Sequenzen, werden Passagen handfester Homophonie fließender Polyphonie gegenübergestellt, lösen sich Dissonanzen in Konsonanzen auf und wird das gesamte dynamische Spektrum ausgelichtet—wenn es auch eher in Richtung forte als piano tendiert. Der langsame Satz, Andante, bietet ein weiteres Beispiel für Blochs Liebe zum Mystischen, Lyrischen und Pastoralen. Er ist eine Air mit Variationen und beginnt in cis-Moll, voller oszillierender Triolenfiguren in der Klavierstimme und lieblichem Kontrapunkt in den Streichern. Kurz vor dem Höhepunkt gegen Ende des Satzes gibt es zwei Passagen, die an markante Motive aus Schelomo und der Suite hébraïque erinnern. Das Finale, Allegro, folgt ohne Unterbrechung und zeichnet sich durch seinen motorischen Drang aus. Die Schreibweise ist meist der des ersten Satzes ähnlich. Nach einer Reihe kaskadierender Skalen schlägt die Stimmung jedoch um, und das Tempo verbreitert sich in das abschließende Calmo, womit das Werk pianissimo in E-Dur endet. Das zweite Quintett ähnelt dem ersten insofern als jedes aus drei Sätzen in kontrastierenden Tempi besteht und jeweils eine enorme Palette von Emotionen, Texturen und Klängen auskundet—obwohl es im zweiten Quintett zugegebenermaßen keine Anleitung gibt, exotische Vögel nachzuahmen. Im Verlauf der dreieinhalb Jahrzehnte, die die beiden Quintette trennen, änderte sich Blochs Kompositionsstil jedoch dramatisch, was sich in den Unterschieden in Dimension und Ethos jedes Werks wiederspiegelt. Das erste ist in seinen Proportionen panoramisch, während das zweite konzentriert und knapp ist. Außerdem findet sich im ersten mehr von Bloch, dem „Neuromantiker“, und mehr vom „Neoklassiker“ Bloch im zweiten. Die Übereinstimmung der Meinung der Kommentatoren, dass das zweite Quintett „abgeklärter“, „nüchterner“, „abstrakter“ und „objektiver“ als das erste ist, muss jedoch ernsthaft in Frage gestellt werden. Bloch verbrachte seine letzten Jahre in relativer Abgeschiedenheit an der Küste von Oregon, und seine prekäre Gesundheit erlaubte ihm nur gelegentlich zu reisen. Die Vitalität der meisten Werke, die er in seinen mittleren bis späten Siebzigern komponierte, enthüllt jedoch eine Geisteskraft und Kreativität, die sich mit der eines Menschen messen könnte, der nur halb so alt ist. Die beiden Klavierquintette bieten gleichermaßen bereichernde Gesellschaft und verdienen zusammen mit den Quartettstücken einen dauernden Platz im Kammermusikrepertoire.